Join Curing Kids Cancer for the 6th Annual Fire Truck Pull! Each team of 10 to 12 “superheroes” will pull in honor or in memory of a child affected by cancer. Teams will not only compete during the pull but they will also compete to receive the most donations and best dressed awards! 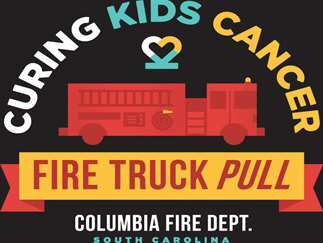 All proceeds from the Curing Kids Cancer Fire Truck Pull will go to Curing Kids Cancer’s $1.2 million endowment at the Children’s Center for Cancer and Blood Disorders Clinic at Palmetto Health Children’s Hospital. This endowment will bring cutting edge childhood cancer therapies to children battling all different types of cancers in South Carolina. This one-of-a-kind event will be hosted by Mayor Steve Benjamin. It also includes many other members of the community—Columbia Fire Department, Lexington County Fire Department, Palmetto Health Foundation, University of South Carolina Student-Athletes, USC Police and more. The Pull begins at 10 a.m. This is a rain or shine event. The Pull is now located on the 1200 block of Lady St. closer to Soda City Market! Sponsorships and team spots are still available for this event. 1200 Block of Lady St.